Hi there, so who are you and why did you create this site? My name is Luboš Brieda, and I am a regular guy born in Slovakia. I grew up in a great city located smack in the middle of the country called Banská Bystrica. I moved to the US with my mom shortly after turning 14, and slowly and surely, began to miss the tasty Slovak home cooking. So I figured I’ll try to learn few of the recipes, and perhaps along the way find out more about the culture and history of my country. I currently live in Falls Church, VA (near Washington, D.C.) with my Colombian wifey Sandra, and have recently completed my PhD in Aerospace Engineering at the George Washington University. I currently split my time between working at NASA Goddard as a contamination engineer and running my own company dedicated to scientific computing and plasma physics, Particle In Cell Consulting. On weekends I like to get out and spend the time outdoors, hiking, running, biking and so on. You can find out a lot of my various hobbies (including the main one, climbing US highpoints) on my personal site. You are not alone! Slovak food is not exactly well known around the world. I am hoping this website will change that. It’s a huge shame – Slovak food is absolutely delicious. And best of all, it’s very easy to prepare. Historically, Slovaks were peasants who spent their days in the fields or herding sheep. As such, the food had to be cooked up fast, but also had to be filling. Many dishes can be prepared using a single pot. But, that doesn’t mean we don’t like the finer things in life. Part of Slovak cuisine are amazing sweets: kolache, buchty, and various Christmas cookies. You will find recipes for many of these on this site. Where is the recipe for holubky? Since getting involved with Slovak cooking, I came to realize that the dish most Slovak-Americans associate with traditional Slovak cooking is stuffed cabbage. This dish is referred to as “holubky” or “halupky”. So where is the recipe, since this is a site dedicated to Slovak cooking? Well the funny thing, the first time I had this dish was in the United States! After more digging, I discovered stuffed cabbage is quite popular in Eastern Slovakia, region heavily influenced by both Ukrainian and also Orthodox customs. Many immigrants came originally from this region, so it makes sense that their American descendants learned to cook this dish. Update 11/4/2011: I finally made this dish, and the holubky recipe is now online! Where can I try Slovak food? Well, this is bit harder. There aren’t that many Slovak restaurants around, unless you are lucky enough to live in New York City or Chicago. Perhaps through this site we can change this? I would very much like to see some Slovak staples (such as the steamed dumpling) to become a regular menu item in American restaurants. Do you own a restaurant and would you like to add something from this site to the menu? Please feel free to do so, just give the site credit when possible. And of course, when you get a chance, hop on a plane and head to Slovakia. It’s a beautiful country full of ancient castles, hot thermal springs, crystal clear mountain lakes and best of all, extremely friendly people. I love Slovak food! What should I do next? Great! First, leave me a comment or two. Then become a fan on Facebook and Twitter, and also subscribe to the news feed. Then, let your friends know. Much of site’s traffic comes from personal recommendations so these help a lot. Finally, if you enjoy this site, please consider making a donation. The site is completely supported with your financial gifts – there are no ads and no corporate sponsors funding it so your donations are very important. Although vast majority of the recipes on the site were cooked by me, I’ll gladly upload your illustrated recipe for your favorite Slovak dish. You can read more about this on the contribute page. 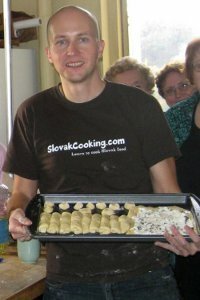 I want to promote Slovak cooking! Do you have any articles I can publish? Yup, please see the Press page. You may also republish articles from this site, as long as you credit slovakcooking.com and shoot me an email letting me know about it. I get this question quite a lot and the answer is that unfortunately not yet. I’ve been meaning to organize the recipes from this site into a collection of my favorite 50 or so recipes, however, I just have not had the time yet. However, I’ll be soon offering kitchen recipe calendars for purchase. Stay tuned! Shoot me email (in English, Slovak or Czech) at lubos@slovakcooking.com or leave a comment. Ďakujem a dobrú chuť (Thanks and bon apetit). Images and information posted here can be used freely for both commercial and non-commercial purpose as long as you give this site credit. However, information may not be used verbatim (i.e. scraped from this site). By scraping the website content you are violating the copyright law, and will be reported to your hosting provider and to Google if running a “made for AdSense” site. 227 comments - What do you think? Hi Lubos! I found your blog while looking up Slovak recipes. I’m half Slovak on my father’s side My grandmother has been gone for many years now, and I really miss her cooking. The only dish of hers that I can duplicate is Halusky & Cabbage, so I think I need to expand my repertoire, LOL! I like your recipes – I’m going to try Spaghetti with Egg, Bacon & Cheese this week. Definitely NOT diet food, but looks so good! Looking forward to cooking Slovak! ta fakt obdivujem ze sa ti takto chce vyvarat! to uz dnes malokto robi, vsetko je len fastfood ako sam hovoris..ale mas pravdu, je to treba, uchovat si to dedicstvo, a odovzdat generaciam, ked uz mi sme to zabalili z nasej rodnej hrude a zijeme za mlakou, teda ja zatial len za kanalom(uk) ale chystam sa coskoro do usa. spread thinly sliced apples (peeled) cover with sugar and cinammon, make a roll, brush with melted butter, sprinkle sugar and top and bake for 15min in a midle of an oven ( 180-200 degrees) , serve with vanilla ice cream, mnam! Ahoj Martina, dakujem pekne za odkaz! I would love to add some sweets, but I have not yet gotten into baking. Maybe you could add few of your recipes to the website? next time am baking i take some pics and email them to you? Sure! Or if you like, you can sign up for an account and add the recipe yourself. Either way, I am looking forward to it! tak tato stranka je super, som rada, ze niekto chce zachovat slovenske tradicie. Ja zijem uz niekolko rokov v UK a tiez to tu nie je slava, i ked uz je tu par obchodov kde sa daju zohnat slovenske ingrediencie. Aj ja rada peciem, ako spominala Martina, ze posle nejake foto, tak by som aj ja chcela prispiet, ked sa nabuduce pustim do niecoho. Hi Paula, good idea. I’ll start posting measurements in cups. The reason I haven’t done so yet, is that when I cook, I don’t usually measure things too precisely. For instance, when I made buchty, I bought a 2lb bag of all purpose flour. The bag said it weighed 907 grams, so I poured in roughly half the bag. But, in any case, for all purpose flour, you have 125 grams per cup. Will tell my Slovakia magazine subscribers about it (some 1500 families across the United States and Canada). If you’d like to see a sample copy of “Slovakia” let me know. Might be nice to make a list of Slovak Restaurants across the US and Canada then when people travel they could plan to visit them. i really love your recipes and you make it easy to follow the directions – the pictures are great – keep up the good work! Is your Dad’s restaurant in Banska Bystrica? I lead tours to Slovakia each summer and it would be fun to visit! Lubos on measurnment in cups. BTW there are sites that do conversion, e.g. Thanks for creating this site. There is so little information on slovak anything!! I enjoyed this and you are well ahead of me with language and recipes!! I am looking forward to trying this. Dakujem vel’mi pekny for making this website! I’ve been looking for a good Slovak recipe website for awhile now, and am really excited to come across yours! My husband is from Zilina, so I’ve been trying to recreate some dishes for him! He will be excited =) I became a Fan of your Facebook page also! Thanks again! Thanks Janet and thanks for stopping by and becoming a fan. By the way, are you also from Slovakia, since your name ends in “ova”? Sorry for my delay in answering your question as didn’t see your response until just now! I am not from Slovakia, but my husband is! When we got married, we had plans to one day hopefully move to Slovakia and I wanted to carry on the tradition… so I took on the -ova form of his last name. It has added a lot of confusion here in the states, but I prefer it this way =) we have also given our newborn daughter the -ova form! On Christmas eve I wrote to let you know how my halusky turned out. My husband and I had a lovely Christmas eve dinner with those tasty Slovak dumplings. My mother always “sauced” hers with cabbage and bacon. I did the same – I had far too much dough even though we over did the meal, but it was divine and took me back to my childhood with parents and grandparents. So pleased to find what you’ve done with the food site and I’m impressed at the busy life you lead, work, school, travel. Dakujem for a nostalgic tour of food and travel. I’m a confirmed fan. P.S. The last name is Polish, but both sets of grandparents were from Slovakia. Thanks a lot Joan! Creating this site was pretty natural for me: I like taking photos and I like to eat. 🙂 I am currently in Slovakia, and updating the site from here is even easier: I don’t have to do any cooking. old stove in my grandparents` blockhouse flavoured the meals with an inimitable natural taste. Fortunately I have eaten most of these foods at my parents´ house. palacinky” and “tatarska omacka” (which fits to excellently “vyprazany syr”). Lubos, in my opinion you have got the black belt in slovak cooking! Regards from Germany. Diese website erinnert mich an meine Kindheit in Vricko in der Slowakei. Als Großmutter die slowakische „kapustnica“, „bryndzove halusky“ oder „kysla fazulova polievka“ gekocht hatte. Ich vermute, dass der alte Ofen im Blockhaus der Großeltern die Speisen mit einem unnachahmlich natürlichen Geschmack verfeinert hatte. Glücklicherweise habe ich den Großteil der Speisen im Elternhaus gegessen. Meine Mutter ist eine Meisterin in „zemiakovy salat“ und „obaleny vyprazany rezen“. Familie verrückt nach „treska“ und „gulasova polievka“ ist! Meine Vorschläge für weitere Gerichte sind „makove sulance“, „orechove palacinky“ und „tatarska omacka“ (die hervorragend zu „vyprazany syr“ passt). Lubos, meiner Meinung nach hast Du den schwarzen Gürtel in Slowakischer Küche! Grüße aus Deutschland. Lubos, recipe for “tartar sauce” the way I lerned it and still doing it. While mixing, slowly add oil while continually steering so that you get the right blend, adding oil slowly is important as if you put it in all at once it will never integrate with the rest. Add some lemon juice from the fresh lemon, add sour cream and salt. Keep mixing. Add chopped pickle, anchovy, lemon zest, parsley and cumin seeds. Mixe all that stuff well and put it into refrigerator to cool and “age”, a half of hour is enough. BTW, I like it a bist spicy and thus I add a few drops of Tabasco. Of course it’s my personal preference, not a part of the original recipe. Ahoj, very nice site, especially the part about ‘zabijacka’, it reminds me my childhood at my grandparents. My parents still do the klobasy at home, but not the other products (which i’m not really fan). And your recipe for Makove slize inspired me for this weekend. Thanks Katka. Yeah, there are many meat products that come out of zabijacka I am not very keen of. There is also something called huspenina, which I believe are jellied pigs feet. I think I’ll stick to sausages and jaternica. Hi Lubos, I love your site. I recently started translating my grandmother’s 80 year old handwritten cookbook from Slovak into English, and have started to publish them on a blog, along with some old family stories. I am also in the DC area, living here with my husband and kids. We will have to have a Slovak meal together when you return to DC! I would love to see some of your recipes in the blog! I have been thinking the same…starting a cookbook would be great way to spread our great cuisine! I’m also a graphic designer and photographer….so maybe we could collaborate! Lorraine, you can see Tonya’s recipes at paulinescookbook.com. And keep me in mind if you ever decide to put together the cookbook. This is something I have considered myself, however I currently don’t have much free time. super stranka a tie recepty…. mnam! Chcela som sa inspirovat co na veceru pre kamaratov, no teraz si uz vobec neviem vybrat lol. My mother made the best Czech tomatoe omacka and spinach omacka. Unfortunately I have lose the handed down recipes. I have tried to find them in Slovak cookbooks but have been unsuccessful, maybe you could help me. Need: 2 egg yolks, 2.5 dcl (little over a cup of canola oil), two pickles (i buy polish dill pickles – not a big fan of american pickles), medium size yellow onion, 1 teaspoon of powdered sugar, 2 tablespoons of mustard (once again, if you have slovak horcica use that before you use american mustard, better yet find either polish or russian – i visit a lot of european food markets), black pepper, little bit of pickle juice. Start out making a basic mayo. Put 2 egg yolks in a bowl and use a hand mixer to whisk the yolks for 3-4 minutes until they start looking smooth and creamy. Then you can start adding a little oil. Careful here since it really needs to be a trickle not a pour. I usually put the oil in the measuring cup with the spout and add a little trickle every 10-15 seconds while mixing the yolks in the bowl. About half way through the oil the mixture should start getting nice and thick. Once that’s done I put the pickles and onion and little bit of pickle juice into a chopper and get it all cut up into grainy mixture. You can control the size of the chunks easily since longer you run the chopper smoother the mixture. Add the pickle/onion mixture into mayo and add the mustard, sugar and black pepper and the tartar sauce is done. Add pickle juice or little bit of vinegar if for more pronounced taste. Enjoy! Skvelá stránka. V zahraničí veľmi často slovenské jedla nevarim, ale po tom ako si mi práve narobil chute tak ich určite budem variť častejšie. Ďakujem za inšpiráciu a pokračuj! Hi Lubos, I just found this website. It seems to be extremly useful, for a person like me, not talented in cooking while loving slovak food. Thank you. Hi Lubos, I too have just found your website. I live in Australia and my father is from Terchova. My mum is a very talented cook and through my parents myself and my 2 brothers we have learnt to cook many slovakian recipes. My father still makes his own sauerkraut, smoked sausages and bacon and my mum makes the best halusky, stuffed capsicum and cabbage. If you ever come to Australia our kitchen is always open. Excellent website. I would like to thank you for making such a wonderful website! I am about 70% Slovak, and thanks to you, I can sample my culture through traditonal (and delicious) food! I really owe you for coming up with such great ideas and recipes! Thank you very much! But I don’t take much credit for the recipes. They are either my grandma’s or they come from “Recepty Starej Mamy”, a really great old Slovak cookbook. I just want to say thank you for this great site! My Grandparents came from the Orava section of Slovakia. We cook many many Slovak dishes from the last one hundred years or so. Thank you again and looking forward to commenting!! Thank you for marketing Slovak culture, Lubos. I am 100% NOT Slovak blood, but this country is my second hometown! come back to Slovakia !! You need some more indoctrination into Slovak food. There is no Slovak cuisine without halusky! Lubos, you know I like this site, thus I am posting this to spare some folks from being scammed like I was. Don’t know how much control you have over ads on you site. Those ads about “Tip of a flat belly”, leading to acai advanced colon, etc. is a deceiving and will cost money if you jump on it with no clear results delivered. I read the article (not on your site) and as I have a problem with weight I went for “1 month supply trial just for shipping and handling” Oh well, never mind, as soon as they had my credit card number, they enrolled me into automatic payment plan, said “we have no free trial” you should have turn it down in 10 days, etc. I talked to both companies, unpleasant conversations. They agreed to cancel my subscription but refused to give me back money they already cashed. Expensive lesson, and here I am, rather skilled IT professional being scammed. Oh BTW, the product delivered NOTHING, maybe I lost a couple of pounds. For all, there are the same acai products based in good nutrition stores, whole food, etc., for a fraction of price these folks try to charge you. I understand the business and need to get some sponsor money from ads to run a site but some of them are bad, and thus I am posting this so other folks do not lose money like I did. Thanks for posting all of this. My family is Slovak and I just returned from visiting their hometown of Hubová (more or less in the Malá Fatra area) and it was beautiful. It’s great to have all of these recipes handy since I know I’m going to be needing some Madarsky gulas, especially, soon. I’m lucky enough to be able to get Zlaty Bazant to wash it all down, too. Madarsky gulas is probably my single most favorite dish. Good choice! Just make sure to make the dumpling (knedla) to go with it, it’s not the same without it. Golden Pheasant used to be somewhat common few years back when I was still in college (Virginia Tech). It’s harder to find now – or perhaps it just happened that the local grocery store down there carried it. But there are few spots here in Washington, D.C. where you can find it, including a liquor store in the Chevy Chase neighborhood. It would not bother mom but it would bother me. It’s enough when you and me will be home and filip will sleep. Hope the Chicago Slovak festival is going well and the rain is subsiding. I know this is a “lazy” request so, if you would, please, accept my apology in advance. Is it possible you can setup a “SHARE THIS” icon at each recipe page (or, for that matter any of your posted entries) so that the reader is able to share, forward, print, or email them? I noticed your comment about the purple carrots and thought you might like to have a peek at this website. http://rareseeds.com/ They have all kinds of seeds that grow vegetables the way they first were — until a scientist bred them differently. Have fun doing what you are doing — keeping in touch with your roots is very important. Barbara, thank you for sharing the link. I checked out their website. They definitely got an impressive collection! Unfortunately, I am not doing any gardening now (no place where to…) but will order some seeds from them in the future when I get a lot. Hello Lubos. I would like you to come to Mexico. I live in Cuernavaca, Morelos State, which is a beautiful place called “la ciudad de la eterna primavera” (the city of the eternal spring) for Humboldt. I learned to cook some slovak plates for my husband who was a slovak. So, it would be an honor for me if you come and try my slovak cooking in Mexico! Wow Martha, that is awesome. Thank you very much for your invite! I am currently finishing my PhD so I don’t have much time (nor the money) to travel, but maybe I could stop by sometime in the future. I’ve been to Mexico few times, but only to the west coast. I used to live north of Los Angeles so Baja was the most convenient for us. I did the Rosarito to Ensenada bike ride twice; it was amazing. I also went to San Felipe for one New Years. Then my mom lived in Puerto Vallarta for couple months so I went there to visit her. That is one amazing town! What a surprise! So, you know some of Mexican cooking and culture! My family is from Yucatan, in the Gulf of Mexico bay, which is very different of Puerto Vallarta. I live in the middle, near Mexico City. So, you are invited to come, anytime. It would be my pleasure. Thank you for your excelent website. I admire you so much for all what are you doing in your life. No super, som rada ze som stranku nasla. I have a restaurant in Longwood, Florida. Check us out at http://www.chef-henrys.com. We cook all the traditional foods there. Mami makes the most delicisious apple strudel and my dad is a mastermind in the kitchen. If you make your way down to Orlando let me know. Would love to have you for dinner and you can try the stuffed cabbage roll or svieckova na smetane. I am from Lucenec and I just spent 4 years there with my husband and kids. Upeciem ti trdelnik ok. No tak pod uz ta cakame aj spat budes mat kde. Papa pozdrav mamicku. Hey there, that’s awesome! Sure, I’ll make sure to stop by one day. You know, I used to live not too far from you. I went to Florida Tech in Melbourne for my freshman and sophomore years. I added your restaurant to my links page. I also mail you few copies of my cooking brochure. Thank you for writing and let your friends and customers know about the site! I just want to say this web site is fantastic and super helpful with my experimental Slovakian cooking. I am a Canadian living in the UK and my partner is Slovakian from near Kosice. He is so happy I am replicating the food from his home so well ! I am making the potato soup now! Thank you very much, Sarah. Comments like yours are what keeps me “in business” (and the fact that I like to eat). Feel free to post your photos on the Facebook page. Have fun and “dobru chut”. What’s your favorite Slovak dish so far? I love your website, I am quite new to it. I am slovak, living in UK. I already managed to cook zivanska. I also thinking you should add some party canapes as chlebicky…I always making them for party and all my UK friends love them. It will be perfect for New Years Eve parties..
Ahoj Lubos, Hope you had a lovely Christmas..I also sometimes cook fasirka similar to recipe – hamburger-fasirka..We call it karbonatky. Does anyone know about pagach? My grandmother used to roll out dough, put a layer of sauerkraut on top, then add another layer of dough on top the sauerkraut, then bake it until it was brown. She took it out of the oven and put butter on top. She only did this for Velija Supper on Christmas Eve. Does anyone know about this recipe for the dough? Múku premiešajte so soľou, pridajte vodu, droždie a vypracujte tuhšie cesto. Nechajte ho vykysnúť. Zemiaky prelisujte, zmiešajte s kapustou pokrájanou nadrobno, potom pridajte nadrobno nakrájanú slaninu, ktorú ste opražili spolu s nakrájanou cibuľou a klobásu, tiež nakrájanú na malé kúsky. Osoľte, ochuťte a dobre premiešajte. Nechajte vychladnúť. Vykysnuté cesto rozvaľkajte na hrúbku ½ cm, pokrájajte na štvorce, na každý lyžičkou dajte rovnaké množstvo plnky a vytvarujte bochníčky. Tie vyprážajte vo väčšom množstve tuku. Ak nemáte chuť na vyprážané kapustníky, skúste ich aspoň z polovičnej dávky upiecť v rúre. Vtedy ale bude lepšie kapustu udusiť vopred aspoň do polomäkka. I would like to thank you for the gorgeous and inspiring work that you do with this website. I enjoy reading all the articles. Despite being a Slovak myself (and a food blogger, too) I really didn’t know of some of the recipes you present. So many thanks! I am so happy I found your site! One of my readers (I have a blog called the Czechmate Diary) told me about this site and I am happy she did. I will definitely link to your blog and I also think that we should exchange links. What do you think? Happy New Year! Stastny NOvy Rok! Anyway, I already have a link to you site, on my links page. Stastny novy rok aj tebe! Paci sa mi tvoja web stranka. Sama som prestala varit slovenske jedla kedze som nutritionist a moc to nejde dohromady so zdravou vyzivou. Musim sa ale priznat ze chcem mojej dcere trochu predstavit aspon nejake slovenske jedla. Tvoja web site mi k tomu dopomohla. PS; ak nemozes najst celery root v azijskych obchodoch ho vzdy maju 🙂 Neviem si predstavit kuraciu polievku bez neho. Celery root maju aj v mojom Giante. Maju tam aj napisane ze maju parsley root, ale esto som ho nikdy nevidel. Chlapik co tam robi povedal ze hej maju tu cedulu ale ho nikdy nemaju. Pojem zdrava vyziva je siroky. Ja s tebou suhlasim, ze slovenska kuchyna s porovnanim s americkou je zdrava vyziva. Ale to nema s nicim nic spolocne. Ja mam skor na mysli velky obsah muky, dlhe pecenie prepekanie a kombinacie ingrediencii ktore su pre ludske telo tazko stravitelne. Ja som zastanca 50-50 ..50% jedla ktore chutia dusi (co je v nasom pripade slovenske jedla) a 50% jedla kotre maju este v sebe enzymy, antioxidanty a tzv,-precistujuce jedla. Tiez si musis uvedomit ze tie ingrediencie ktore tu v amerike kupujes v supermarketoch uz vobec niesu co pouzivali nase stare mamy. Muka je z GMO Jacmenu neohovriac o ozarovani, maso zo zvierat ktore su spravne zivene ziskas len v specializovanych predajniach..ale nechcem do tejto krasnej web stranky vnasat ziadnu sedotu. Chcela som ti len podakovat za krasnu preciznost v receptoch a pochvalit ta za nadsenie a laskou k slovenskej kuchyni. Zelam ti do Noveho Roku Vela Zdravia! Zuzana, bohuzial mas absolutnu pravdu co sa tyka kvality potravin. Je to velmi dlha a smutna tema. Potraviny krore boli kedysi bezne su dnes Organic. No nebudem si radsej kazit naladu. Bez celera-celery root (ale kelu-savoy cabage) v slepacej polievke to proste neni ono! Sice nemam ziadne azijske obchody v okruhu 100 mil, ale nepravidelne sa objavuje v Safeway-i aj inych potravinovych obchoch ako napr. Raleys (CA,NV pokial viem) ale aj napr. Smith’s (AZ, ….). Prave teraz ho vidavam pravidelne, asi je uroda v Mexiku…. Este k tomu celeru, ak mam stastie a kupim ho aj s peknou sviezou zelenou vnatou s hustymi listami, odrezem celu tu vnat, oplachnem vo vode, omotam tenkou nitou aby sa to nerozpadlo a dam varit do slepacej/hovadzej polievky tak 15 min pred koncom. Po dovareni polievky si to vytiahnem a zjem len tak samotne, jemne osolene. To iste robim aj s pertzlenovou vnatou. Velmi to lubim. This is Awesome. I lived in Slovakia for about 2 1/2 years teaching english. I learned some basic conversational slovak. I even got to take part in Zabijacka. Anyway, I miss being there it is great I can good food and have fond memories. Where can you find Brynza Cheese or something similiar in the US? I so miss Brynzdove Halusky!!! You can get close to Bryndza flavor with Feta cheese if Bryndza is not available. Thank you, Rado. SCV is a great place to get real authentic Slovak treats, including bryndza. However, if you are looking simply to approximate the taste, I found that the “Pastures of Eden” Isreali-style Feta from Trader Joe’s tastes very similar to Slovak bryndza (bryndza and feta are both sheep cheeses). Excellent website. Nice graphical work and recipes that remind me of my mother’s cooking. Keep it up. I have recommended that we publicize you in Canada. Maj sa dobre a stastlivy novy rok..
Love your site!! My grandmother was a wonderful slovak cook. As a little girl I spent many hours with her in the kitchen, unfortunately I never got any of her recipes. I’ve always felt a little lost about my Slovak culture, my grandparents were well acclimated to the US by the time I came along. The extended family in this country was few and far between. Compared to my mothers many siblings and relatives- everyone knows about Italians. But Slovaks were different, as a little girl I would ask my grandfather where we were from, he would get frustrated and tell me checkers. I adored my grandparents and I am so happy to find this site. To learn more about the Slovak culture. As an adult I have managed to get a copy of a Slovak-American cookbook from a friend- published in 1952. Funny it is the same cookbook my grandmother gave to her Italian daughter-in-law when my parents got married. I’m wondering if Rado & Zuzana, previous blog, are my cousin & his wife–we shall see! Any way sorry to get emotional–just so happy to be here. My name is Rachelle, but grandpa called me Dumpling. So I’m gonna go with Dumpling on the board-ok? Or how about Knedľa? That’s how you say dumpling in Slovak. It’s also a feminine noun (all nouns in Slovak have genders, just like in Spanish), so it even fits 🙂 Anyway, thank you very much for your comment. A lot of Slovak history has been passed down from generation to generation only orally so I am hoping that through the magic of the internet, I can help preserve some of these old recipes for future generations. Let’s just hope they have computers then too. Hi I found your site today, and yes lubos keep the Slovak tradtion alive here. Dovi! Dumpling, do you have any documents of what part of Slovakia your Grandparents came from? Dakujem Maja. Recept by bol super, mozno ho mozes nechat ako koment tu: http://www.slovakcooking.com/2009/recipes/sauerkraut-soup/. Moze byt kludne po slovensky. Enjoy your site, excellent job. I also left Banska Bystrica at age 14 for Canada, and am now professor emeritus (Engineerin Geology). How are your PhD studies progressing? Ked uz nemam labak, teraz robim vyskumi v kuchini ked my manzelka dovoli…. Uplne super stranka. Hladam slovenske recepty do prezentacie pre Turkov v anglickom jazyku a nasla som toto. Aj ostatne casti stranky sa mi pacia. Veru tak, cloveku sa v dalekom svete asi obcas cnie, vsak? A to potom kapustnica vylepsi naladu. Alebo slivovicka? No tak mna vazne asi porazi od tolkej radosti ked len pozriem na tieto fotky chutnych jedal nasej slovenskej kuchyne. Neviem ako som sa dostala na tuto stranku ale chcem pochvalit na idei a podakovat. Urcite budem pouzivat tieto recepturi. Som zo Srbska (cize dolnozemska slovacka) a som v USA uz zopar rokov na studiach. A je mi fakt uz zle od fast food… rada varim len nikdy si neviem sama porovnat ingredience. A vazne by tu niekto mohol uz aj otvorit slovensko-srbsku restauraciu 🙂 S kamaratom sme boli na veceri v nemeckej restauracie a som poradila nech si da gulas, no ale to bolo na nic, tak teraz ja navarim za pomoci tejto stranky. Este raz dakujem. Hehe, dakujem! Inac ked budes varit ten gulas, tak ho sprav podla tohto receptu. Je podobny kotlikovemu gulasu, ale je v tom aj paradajka a paprika. Ten chutil kamaratom viac. Lubos, thank you very much for putting this awesome site together. I am finally learning to backup up my Slovak origin with the Slovak cooking! You seemed to have figured out how to cook Slovak in America. Could you please for us beginner cooks maybe provide slovak / english meat part dictonary? hovadzie zadne, hovadzie predne, pliecko, krkovicka… in USA? That’s a great idea, Kristina and Rado! I’ll work on this as my next blog post. Should be online by the end of the week. One problem I have found is that often it simply is not even possible to find the right kind of meat here in the US. While in Slovakia we still had butchers when I was growing up there, here in the US everything is shrink wrapped unless you are lucky to live close to an international market, and the only cuts of meats are the prime ones suitable for grilling. Slovak recipes are designed to fully utilize the animal, so some recipes (like soups) use some less-than-prime cuts of meat, which is fine for making stews and soups. For instance, krkovička (neck meat). That’s definitely a hit-or-miss in my local grocery store. Hey Lubos! yes very good idea about the meats. Hi Philka, yup I am. Stay tuned, there will be blog posts added about our adventures. and stay cool, have some zmirzlina! and some for me too! If you go to Stupava, just few kilometers East of Bratislava , I have good friends there. and best Icecream shop there, too. Philka, Stupava je známa pestovaním a nakladaním kapusty /zelá/. Práve teraz je kapustová sezóna. I also have a big problem to find the right meat in US because I do not know how to translate Slovak names of meats. If somebody knows please post it here. Some kind of guide would be greatly appreciated. Let me try as I have some free time. It’s not easy match/translation as american cuts are a bit different and more detailed than Slovak cuts. There are group of meats/cuts and they include more detailed cuts. predna glejovka = shank cross cut, usualy used for a ground meat and stew meat. there are many details in pork meat that are usually not used in the US cooking. Aka, “vnutornosti” including heart, liver, kidney, brain, toque, stomach, etc. They are used in “zabijacka food” not so known in the US. Some processed parts you can find in a specialty stores. Aka tlacenka known as head cheese in the US. OK, with Lubos encouragement I’ll continue. don’t forget some offal (vnutornosti) e.g., veal livers – telacia pecen is superior to beef liver, etc. Here is jahnacie maso (lamb), one of my favorite. Baranina (mutton) has the same cuts, the difference is that lamb is usually a few months old sheep. Mutton is 1 -2 years old sheep. In Slovak cooking lamb cuts are the same as veal cuts. This is a tricky part if you don’t know your meat. There are recipes to turn any meat into tasteful and delicious meal, however, if you don’t coock it right the result may be very disapointing. A prime cuts, aka “svieckovica, rostenka, etc.,” will do just fine in a fast roasting, searing (fast burn of top layer on a skillet with minimum oil) which keeps juices inside the meat nand doin’t take a long to prepare. Secondary cuts, aka “plece, stehno, etc.” may not do so good in fast roasting, searing but will do excellent in slow searing followed by stewing with some onion and veggies. It takes longer but you don’t end up with “tough” meat as if you just sear it or threw it on a barbeque for a short time. I may marinate a roast meat for 24 hours, then put it into oven and slow roast it (depending on weight it may take 3 hours on a low temp). Yes selection of the right meat makes a difference. Aka, meat with little fat (or marble marking) is going to end to be a dry and not apealing, and you have to match the meat with recipee. Even in traditional stuff, like “kapustnica” you better pick up the right meat or you will end up with dry and not so tasty meat components. Lubos, We are going to spend the next 2 days near Banska Bystrica. Where is your Dad’s restaurant? I’d like to try to make it there if we can. Hi John, it’s Zlte Piesky by the bus station, but I am not sure if it’s operational again (well the bar is). He was planning to do renovations last time I spoke to him about it, but go and check. If not,you can at least get some beer in a real Slovak krčma (pub). Lubos, Unfortunately I got in touch with you too late. Our time was limited and we were unable to make it there. But, now having seen Banska Bystrica, I can understand why you love the place so much. It is a beautiful city! I was able to do some biking through Sliac, Velka Luka, and the stretch of yellow trail from Horna’ Micna to Vlkanova was spectacular. This was our first trip to Sovakia. Next time, though, we WILL make it to Zlte Piesky. I´m a Czech (on moms side) and Slovakian (on dads side)girl living in Sweden. I have lived here for all my life. I came across your page while looking for recipies. It is really great!I´ve just made smazeny karfiol s bramborovou kasy for my family and they relly liked it. For the swedes this is a strange dish, carbs served with carbs?!? =) I too really miss the food I was grown up with and I´m really enthusiastic to learn more recipies from the czech and slovak cuisine. This page is bookmarked on the spot! Dakujem za dobru stranku a maj sa moc dobre! Thank you so much for this webiste!! My husband & I moved to Bratislava from the US a few months ago and I’ve been looking for a site like this! I LOVE to cook but was feeling so frustrated because I don’t speak enough Slovak yet to follow the recipes in the local books but the English recipes for Slovak food that I found online are NOT the traditional meals that we’ve had since our arrival here. Having recipes in English that also explain the Slovak words for some of the ingredients has helped me be able to shop in the markets and prepare the same authentic, delicious foods we’ve come to love during our time here. I found your website last night and already have many meals planned for this week!! Ahoj MJ, recept na jednoduchú paradajkovú polievku. Do hrnca si nalejem olej a pridám 3-4 veľké lyžice hladkej múky. Urobím svetlú zápražku a zalejem vodou. Rozmiešam paradajkový pretlak, osolím, pridám celé čierne korenie. Nechám povariť. Ako závarka do rajčinovej polievky sú vhodné drobce, ryža alebo strúhaný syr, ten sa pridáva až na tanieri. V školskej jedálni nám varia veľmi chutnú rajčinovú polievku takzvanú “milánsku”. Milánska rajčinová polievka sa zalieva šľahačkovou smotanou a pridá sa kopor. Dnes som aj ja varila rajčinovú polievku a uvedomila som si, že ju treba trochu prisladiť. Pridajte teda do nej 1 lyžicu kryštálového cukru. Joys, tomato’s cooking (paradajkove varenie)usually require adding a bit of sweet sugar taste to balance a natural acidity in tomatoes. Tomatoes, especially tomatoe juices have a natural high level of acidity and thus cooking with it, especially in meals that are thin (like soups or souces) adding a bit of sweet taste is a good idea to make the taste balanced. It does not full the stomach and if you are suspect to high acid stomach problems, it’s better to avoid tomato soups or souces. Ďakujem Mirko, používanie paradajok v slovenskej kuchyni má veľkú tradíciu. Keď mám v záhradke veľkú úrodu paradajok, robím paradajkovú šťavu. Paradajky rozvarím, prepasírujem a ešte pomeliem v mlynčeku na ovocie. Získam tak paradajkovú šťavu s prirodzenou chuťou, lepšiu než je paradajkový pretlak z obchodu. Joyce, ja by som asi bez paradajok nemohol zit. Cerstve, alebo uvarene, musim mat nejake kazdy den. Snazim sa pestovat trochu paradajok za domom, ale pretoze byvame na predmesti v lese, tak ich obycajne srnky zjedia pred tym nez dorastu. Pred par rokom some mal problem zo zaludocnym vredom a tak som si musel dat viac pozor co jem. Paradajky, pretoze tvoria viac zaludocnej kyseliny neboli najlepsie, ale som sa ich nevzdal, obmedzil some ine jedla ale paradajky som stale jedol. Zato viem a davam si vatsi pozor s paradajkami a trochu ich prisladim ked robym paradajkove polievky a omacky. Zdravím Mirko, je sezóna rajčín a papriky. Tohto roku je dobrá úroda. Dnes sme celý deň varili lečo. Lečo dávam do 3 dcl a 7 dcl pohárov a sterilizujem. 3 dcl lečo pridávam do gulášu. Iný guláš nám nechutí. Pekné leto prajem. P.S. My husband and I already tried a few recipes (with some variations based on his family’s recipes) from this site – they’re great! I just bumped on your blog in search of a recipe for an “interesting baked rice pudding with egg yolks”, and I liked your pudding recipe. So I decided to read the “About” page, and you know what? I also live in Falls Church, VA, and I am a GW alumna! What a coincidence! Anyway, excellent blog, good luck with it! Hi! I discovered your blog while searching for recipes for my international cooking blog. I gave you and your blog a big shout out, linked back to you and included your mushrooms soup recipe (and link back to you with credits) Love you blog and your writing! don’t know where to put it, Vaclav Havel just passed away. I somehow knew the man, met him once, he was my kind of guy in the old country. RIP Vaclav, we all have to go at some point of time, and before you went you did good at contributing to a human race and advancement. I hope it’s OK to shed a tear, as he was a different type of warrior, maybe not fit for a crazy world we live in, but he never gave up. AHoj Lubos, Aj ja sa pripajam k clenom tvojho blogu/stranky… Pred nedavnom som ju totiz objavila. Na Silvestra som pozvana k priatelom a kazdy ma priniest nejake typicke narodne jedlo. Ja som si vybrala FASIRKY. Idem ich robit podla tvojeho receptu. Som zvedava, ci im budu chutit. Zajtra idem na Cesnacku ! A ten preklad tych casti rozneho masa je uzasny, co tu dal Miro…. to som potrebovala, lebo s masom mam najvacsi problem. I would like to support your website with some ideas, insights and my sister can make some pictures while she cooks at home in Slovakia. Thanks for everything, our store carpatia sausage, shoreline, seattle, wa loves your recipe ! Well, as nobody mentioned it, I will. Lubos just got engaged to a very nice lady. Miro, how did you know? Thanks guys! I posted the info on my facebook page so that’s where Miro heard. A friend of mine remembers a dish that his grandmother called plnena – but I think he has the wrong name. He described it as a dumpling filled with various chicken parts (gizzards, etc.) and he remembered it looking like a ‘brain’. Any idea what that might be? Thanks! In cold weather, you can cook the jelly soup. The collagen content is good for the joints. In a month I am going under the knife again, for a total right knee replacement followed by left knee replacement in about 3 months. I am suppose to lose some weight to “lighten the load” which would help in healing and recovery. So here is a challenge, give me some good recipes for losing a weight, not too many carbs, not much bread, pasta, dumplings, etc. Meat and veggies, I guess sauerkraut or cabbage is OK.
@Miro: Personally, I think Holubky is the most complete food on the planet. You could eat it morning, noon and night and be 1) completely satisfied and 2) nutritionally complete. Give it a try, see how it works and we can patent the new Slovak diet. Greta site, Lubos! Thanks for the effort. Since 2000, I have made 10 trips to SK including one to celebrate the wedding of the young lady who served as my translator on several trips. I really enjoyed the Slovak tradition of the beautiful cakes and pastry trays that were brought by the guests as wedding gifts. The sweets table was magnificent. BTW, I’ve been through BB (I have a good friend who teaches at the seminary there) on my way to Hronec! Can’t wait to go back. maybe this summer. Djakujem, Lubos! I can’t tell you much about “Janosik’s Braid” must have been a local recipe and I have no ide what it was. I can tell you more about “pig knee”, I had it in my old town – Zvolen. It’s a slow broiling, takes a time but result is delicius. Soft meat and crunchy skin. Slow does it, and it takes time, no need to fancy prep and spices, just put it on a gril or into oven and give it a time. It looks like you haven’t blogged in a while! I just found your site, because sometimes I write about my family’s cooking. They come from Michalovce. I grew up in New Jersey but attended Georgetown University and lived in Reston, so I know Falls Church quite well. I want to see more recipes from you! Yeah, I’ve been super busy finishing my PhD dissertation. But it’s finally done! Submitted last Wednesday, then spent the long weekend in Guadalajara, Mexico visiting my gf’s brother’s family and just got back. Planning to bake some sort of a cake this week to celebrate being done. a Slovak cake? which one? I usually get slovak recipes from my parents back home. However, their way of writing the recipes is very vague and therefore for me as a cooking noob almost impossible to make without making 2 or 3 additional phone calls 🙂 I feel that this website can put me back on track of my casual, only when I feel like, Slovak cuisine cooking. Here I can take advantage from lots of screen-shots and detailed description. I think I will start with something “simple” as “Cesnaková Polievka”. Needless to say, this is a great website ! And I can tell, as I seen a few already 🙂 Informative, meaningful, precise, well structured and easy to navigate. Surely, you did put a lot of effort into it ! I am putting together a group of slovak recipies that I grew up with. These are for my son, who is a chef. My mother made many of the recipies that are on this site Lubos and all are bringing back memories. Today is Good Friday and I have just made an egg creation that she and her mother always made at Easter. Here is the recipe. I used Skim, makes lighter version, but the higher the fat content makes it richer. Break eggs into a none stick saucepan and add milk. Whisk up the mixture, but not too much. Heat on medium heat stirring constantly but gently with a wooden spoon. In about 10-15 minutes the eggs begin to cook and create lumps, like curdles. The mixture begins to pull together, but not harden. When you have a mixture like loose scrambled eggs pour the entire mixture in a cheese cloth lined strainer over a bowl. It will be hot, but pull up the cheese cloth and gently squeese together to form a ball. Tie as tight as you can with string. (I use an elastic band) The liquid from the milk and eggs left will drip into the bowl. Refrigerate in this shape about 2-4 hours until cold or overnight. Unwrap, slice. This is so good on Easter morning on a slice of fresh bread, in a sandwich, tomato, ham etc. If you have ever heard of this recipe or even made it please help me with the Slovak name for it. Maybe its just a recipe my grandmother developed, but I remember it from 50 years ago. I make it now every Easter. Both my grandmother and my mother and father are gone, and I never, ever thought to ask the name. So good. Hi Irene, this Easter dish is popular in eastern Slovakia. Called lump /hrudka/ or cheese /syrek/. Happy Easter. Hello ladies, I found the egg cheese for you in English. I wish you a blessed Easter. Josephine: Thank you Thank you. As soon as I saw “hrudka” I remembered the name. I am eating a slice as I am writing this. This site is so wonderful in helping me remember all the slovak foods my mom used to make. My father loved it as well. He was born in Cinnobana, and my mom was born in Jancovce. The met and married in Montreal. Thank you again. waxpaper and chilled it. We also took it church inthe Easter Basket for the blessing. Happy Easter to and all viewers here. Great to find you on the web ! You never cooked us some of your great meals while in B.S. at VT 😀 ! Hope you’re doing well (and not too fat ah ah ;)). Melvin, the guy with aerospace diploma who’s actually never worked in aero. Melvin: You must be getting me confused with someone else (same name?) Where and What is B.S. at VT. and I have never known a person named Melvin. Please tell. Irene, that comment was meant for me – I got my Bachelor of Science (B.S.) in Aerospace Engineering from Virginia Tech (VT). Melvin – I didn’t get into cooking till much later. When I was at VT, my diet consisted of P.K.’s pizza and Sharkeys’ wings. Good times. Iam a first generation slovak born in this country, 83 years of age. My Father came from Siroke and my Mother from Kosice. My Grandparents were the first in our family to migrate to America. When I think of the Slovak meals that my Mother and Grandmother used to make, my mouth starts watering. Thankyou for your site, It’s in my favorites and will be visited often I asure you. Thank you for creating this site! We just returned from a 10 day trip to Slovakia visiting two foreign exchange students who lived with us two years ago, one from your hometown and one from Sulov Hradna in the Tatras region. We really enjoyed their families’ cooking and am looking forward to trying your recipes as well. Beautiful people and a beautiful country! I grew up on the Midwestern United States and would get tastes of delicious Slovak food at potlucks and a few diners here and there. (You should see how fast the Kolaches go at a Midwestern bake sale!) I’ve always liked the cuisine, but didn’t have access to it once I moved out to the West Coast. Thank you for the wonderful tutorials on Slovak cuisine! I absolutely love your site. My husbands grandmother was Slovakian/Czech and made the most amazing food. Unfortunately she took her recipes with her to the grave and my husband and I had only been newly married so I didn’t learn her recipes. Now my husband misses Halušky and Pierogis and this soup for the life of me I can not find anywhere online and can’t replicate like hers. It was a cabbage soup she called something like porage (sp and pronounce) it was pure comfort food. Oh yes Cabbage Soup. The best and easy. This is how my mom made it. –Put the saurkraut in a pot and fill with clean water. Put enough water to depend on how thick you want the soup to be. –Add to taste – salt, pepper and paprika. it the best comfort soup ever. Butter or margarine melted in a saucepan and add flour to make a roux. Brown,to a medium color. Add to the soup and stir. This will thicken it a little. Butter or margarine melted in a saucepan. Add 1 medium or larger small slice onion. Brown to just barely burned. (Lots of flavor) Add to the soup. This is a delicious soup, especially served with a hunk of black or rye bread. Arika. I am saddened to read that your mother in law was unable to share her Slovak recipies with you. My son is a chef in Vancouver and he always enjoyed the Slovak cooking that my mother taught me. He asked for my recipe for Cabbage Rolls and made them as a feature recipe for the restaurant. The clientele went wild. I am writing down all the recipies from my mother that she had written down and ones that she did not and doing a cookbook for him so that he can make them and always have a taste of Slovakia and his mom’s cooking whenever he wants. Most of the recipies that are written down have no measurements, only the ingredients. It’s too funny, because that’s how she got them from her mother. velmi dobre sa citaju vsetky odkazy! Kazdopadne stranka super, mas moj obdiv, a bola by parada keby sa Slovenska kuchyna stala tak prezentovanou ako napriklad mexicka, cinska, talianska alebo ine. dobra praca lubos! ja uz 8 rokom zijem v anglicku ale povodom som zo zahoria (takze slovenske jedlo mi tak moc nechyba lebo je to len 2 hodinky letom domov a v londyne je skvela ceskoslovenska restika) a mam za zenu tiez kolumbijku (kathe a je z cali)!!! haluz, snazim sa jej varit nejake nase veci a treba povedat ze tato stranka mi to dost ulahcila! diky strasne moc a keep the good work! I absolutely love your website! I have learned so much on top of what I had already learned from my slovak grandparents and my slovak friend from high school (he was an exchange student my senior year). It has been exciting, and I always share your site with friends and family interested in slovak cooking and baking! Thanks Dan! I can imagine that it must be very difficult being a Slovak vegan, but I agree on the simple staples. In fact, although most Slovak meals contain some meat, at least in the form of bacon (which appears to be considered a vegetable as you’ll often find dishes with bacon listed under “vegetarian” option in the menu…), the cuisine is not as meat-heavy as the US one. At least that’s my impression. When I was growing up, we never had dishes similar to the American steaks where the plate consisted of meat and not much else. I am sure this was due to the economic reasons, as meat used to be much more expensive, so people found ways to fill the plates with side dishes and sauces. I just cooked detvianska nátura, gulášová polievka, zemiakové placky, and rožky for the first time. My great-grandparents came to the US from Eastern Slovakia and although I have cooked the other dishes of my ancestors (Polish and Irish), I had never cooked any Slovak food. I’m pleased to say it was a success and my mother got a taste of the cooking that her grandmother used to make when my mother was a child. I traveled Slovakia in April 1993 (I am Bulgarian) with some friends and I loved the folks, the beer (I had a great one in your hometown’s main square’s rock cafe), the mountainous scenery and the GOULASH! I loved it so much from day 1 that I don’t think I ever ordered anything else. It seems there are many versions, but everywhere I tried it over there it was thick. What I cannot produce well here when I try to cook it is to make it THICK. I remember they would serve it in a large deep bowl I was wondering whether to use a spoon or fork. How do you thicken it and keep it without losing the soup? I kept on reading and I think one of your readers mentioned that the caraway that is added and the peppers help thicken the sauce, so I will try that next week. I don’t think that adding water is a good option. If I remember correctly there was always small pieces of potatoes and I would add a few carrots, see how it goes. Dakujem!!! My american wife will love this site. We are always struggling to find the right ingredients or substitutes. This will make our lives easier! Happy new years, we will bee making your kapustnica! Can you recommend a substitute for slovenská točená? Other than the shape, is it different than kielbasa? Kedy sa už konečne naučíte písať názvy slovenských jedál tak, ako sa píšu? Veľké písmeno je len prvé písmeno v názve a žiadne iné! Zato, že Američania píšu všetko s veľkými písmenami, to ešte neznamená, že sa musite po nich opičiť! Napríklad názov Domáce Víno sa po slovensky píše Domáce víno. A tak všetky recepty. Keď ich kopírujete zo slovenských web stránok, tak ich kopírujte správne. Slovensko je v Európe a teda v civilizovanom svete! Jozef, not a big deal and yet. There are some rules, especially when it comes to publishing and Internet com. Header should be with each noun in Capital letters, verbs in lower letters, and articles not used in headers/titles. when it comes to a full body in articles, there rules do not apply. Not sure what is such a big deal, as this site is baseld in the US and using what is appropriate, Of course we all break “grammar rules” but does it really matter? Oh BTW Jozef, with Lubos going recently through PhD program, I know that he was taught a lot about how to write a research papers and all the rules for publishing. So lets leave it alone, this is a site based in the US, done in English language and thus follows the rules of English writing. Yes it is about Slovak cooking, but not written in Slovak language. I am sure you would not want to follow recipes for Chinese food in a Chinese language and grammar rules. The same here, most American Slovaks do not speak much of Slovak language as they are 2-3rd generation of immigrants. That’s a reality and thus using English language to present Slovak recipes, is the right way to go. sorry for my rant but I know what I talks about from my personal experiences. Jozef, dakujem za komentar, nevedel som ze na slovensku tak strasne zalezi na tom ktore pismena su velke. A hlavne som nevedel ze je to znak necivilizovanych ludi. Ale pravdu povediac, je mi to dost jedno… Mne sa osobne paci viac tento styl – moze to byt tym ako pisal Miro ze ja som sa naucil pisat hlavne tu v USA a v USA je “title case” uplne bezna. No a Internet je velka, tato stranka funguje uplne v mojom volnom case, a tak isto mozes zacat web stranku ty v ktorej si mozes pisat pismenka ako chces. pozname sa z meet-upu v Marylande a z korculka v Edgewateri. Ale, ze ta najdem na tejto stranke som necakala. Musim povedat, ze ma tvoja stranka velmi potesila a pomohla mi vo vareni. Mas tu vela informacii, z kazdeho rozku trosku, ako sa hovori. Chcela by som si pridat link na tvoju stranku o vareni, na moju firemnu stranku – tlmocnictvo, prekladatelstvo. Okej Zuzka, fakt to uz bolo riadne davno. Cas leti! Dam ten link na links page. Looks like an interesting site. Pozdrawiam serdecznie. Thanks for all your hard work on this sight! I’m loving it! My parents are from Slovakia and my mom can’t remember how to make some of the meals from there because she doesn’t cook anymore and I thought the recipes from my childhood were long gone. Keep up the good work! Does anyone know how to make the caraway liquor that was made at Christmas? Rascu vmiešame do liehu a dobre uzavrieme. Necháme postáť 4 dni.Potom dáme variť cukor do 1 litra vody na niť (15 min. )Do vychladnutého cukrového sirupu prefiltrujeme rascový lieh. Nalejeme do fliaš,dobre uzatvoríme a skryjeme. Potrebne je jedine zariadenie s internetom a cool foto. Ziadne zhananie pera, znamky, ci posty. ja tak trosku od veci, ale zacinam byt trosku smutna nakolko som DC oblasti uz tri roky a nepodarilo sa mi este stretnut ziadnych Slovakov, kde ste strateni? My grandparents were Slovak and I have been to my grandmothers village, Turany. Thanks for this site. I dearly miss her cooking. Their last names were Benova and Sturziec, which was changed to Sturdik. Hello Lubos, Thank-you for this sight. My mother is from Slovakia and growing up, I enjoyed all the home grown recipes. My mother doesn’t remember too many of them now so it is a pleasure to find them here!! Many thanks again! the world, mostly of Europe, of course…. because T-shirt is exactly what my collection the grea number of it! I’m so sorry to bother you but at least I try to make my collection even more larger. whatever frre of any charge for me to my home address (see it below)! Dobry Den. I love your sight. My husband and I are both Slovak. My Grandmother came to the US via Ellis Island when she was 14. I have been gifted with her pierogie and halupki recipes which we make often. Be glad to continue to support your site. Good blog you’ve got here.. It’s difficult to find quality writing like yours nowadays. I truly appreciate people like you! Take care!! I will be happy to come to your attention a new unique book “ONE THOUSAND AND TWENTY YEARS OF YOUNG SLOVAKIA” with subtitle “The first complete book about the Slovak Republic”. The book all in ENGLISH is included in the collection of rigorous selected, the largest and most prestigious library in the world – the Library of Congress U.S., Washington as first formed by Slovak editors /Dr. Ivan Klč, Editor-in-Chief, Dr. Danica Filová, Marián Petričko/ and authors /85 autors of articles/ – after 154 years! The book was printed in Bratislava /Printing company Kasico, a.s./. The book was selected last week by the Vatican Library. The book also used to promotion Office of the President of the Slovak Republic and the Ministry of Foreign Affairs. Professional consultant: Doc. PhDr. Ján Sand, PhD. The publisher of the book is Dušan Kutálek. To content also participated the Ministry of Culture of the Slovak Republic. Chapters: History, Regions, Microregions, Nature, Society, Culture, Traditions, Curiosities, Famous people. The book will have its premiere at Expo 2015, Milan /1st May 2015 – 31st October 2015/. We just got your book: One thousand and twenty years of young Slovakia, which we ordered and we like very much, it is truly unique and perfectly prepared. We would have ordered another 3 pieces, we want to send to our international partners (Russia, China, America). Thank you very much and wish a lot of success. I ordered the book and just received my copy. I am very pleased with it and highly recommend it to others. So happy to have found this page! I’ve got my first Bublanina in the oven right now, although it’s a different recipe than yours so I am not quite sure how well it will turn out. Can’t wait to explore your site some more! Thank you for your wonderful website. Interestingly enough I just made Halubky as the weather has finally turned coldish and rainy. All four of my great-grandparents came from Parnica in Dolny-Kubin shortly after the turn of the last century. I don’t recall any of my grandmother’s Slovak recipes containing much dairy, notably pirohy. I had a great-aunt that was of Polish descent. She made her pirohy with sour cream and there was always a debate about the “proper” way to make it. Do you think the Hungarian influence in certain areas of the country accounts for some of the differences? Lots of Czech-Americans here in Central Texas but not too many Slovaks. We offer opportunity to obtain licence approval for a factory for production of MOKA a flour made from fish . it´s great what you are doing 🙂 I was happy I stumbled across your website. I also run a plant-based foodblog in London. However, it is not about traditional Slovak cooking. Though, I am planning to include more Slovak as well as Central European recipes or recipes that have some sort of Slovak influence. Keep up a great job! Tried to subscribe and got a page not found message. Thanks for letting me know. I’ll check tomorrow. I miss my grandmother’s and mother’s cooking, especially around the holidays. I grew up with the familiar recipes of polish potato pancakes, pierogis, and the like. One thing my mother made often is French toast with a savory tomato-based sauce. Not sure if this is a Slovakian dish or if my mother made it up, but I can’t seem to find anyone with knowledge about it. Have you ever heard of anything like that? Let me know. My mother made a tomato cheese sauce we put on toast. I live in Quebec, Canada. This recipe with green beans as a main ingredient in a soup is not common in our part of the world! Wow!!!! my husband and I loved it. Just brought it up a notch by starting with some onion, garlic and a few slices of bacon. Some chicken broth with the water and the rest just as you are instrusting us. A wonderfull soup, THIS IS NOW A STAPLE IN OUR HOME. I belong to First Catholic Slovak Ladies Assoc. and they sell a cookbook. I came across your website looking for slovak recipes. And what gold mine of slovak favorites. I cant thank you enough for putting these recipes on the web. I baked rozky today and they turned out much better then expected. I will be cooking lots of these in time to come. Thank you for this great website. My grandparents came from Kluknava in the Kosice Region. I grew up on all the staple Slovak dishes and miss my mother and grandmothers cooking and always had Slovak spoken at home, though our generation was sadly never learned it for whatever reason. One day I hope to visit my ancestral homeland. For now, I’ll learn from your website and try and master these recipes! You keep other benefits in the process and could pay off your personal injury lawyer. am impressed! Extremely helpful info specially the last part 🙂 I care for such info a lot. Just visited the website, the receipts are superb, but people seemed to have gone lately… to McDonald’s?! I hope not. Can somebody help me with the steamed dumplings receipt? Found it here: http://www.slovakcooking.com/2009/recipes/steamed-dumpling-parena-knedla/ It needs a packet of yeast. Don’t have that in Canada, but I use Fleishmann’s active dry yeast. How many grams should I use? Much appreciated! And a Happy New Year to all! Peter, I’m not sure how many grams, but a standard packet of yeast is equal to 2 1/4tsp. Or 1/4 OZ dry yeast. Is there a cookbook coming soon before this website expires? It would be a pity to lose so many great recipes!